I managed to get a game 2 days ago, and it was a crazy 4,000-point game! I got to play with the kids, and a third guy wanted to join in, so I suggested we play a team-game, with him and me bringing 2,000 points of our Imperium armies against 4,000 points of Orks. The other kid was pleased to oblige, for he had a Stompa and I really wanted to test my Shadowsword against the Stompa. I probably won't go into detailed turns here, but basically the Ork guy brought his Stompa, at least 6 Killa Klans, 2 Deff Dreads, a Mega Dread (I think that's what it's called), Ghazghull, Mega-Nobs, a couple of Big Meks, a Painboy, 3 squads of Boyz (20, 30 and 30), 20 Grots, more Nobz, Scorchaboyz, Lootas and Tankbusters. And his Stompa, of course! 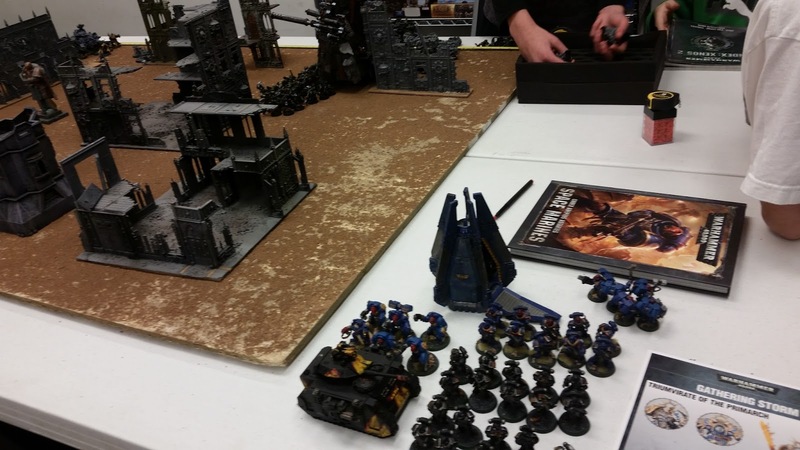 My Ultramarines ally brought Roboute Guilliman, 2 Legion of the Damned legionnaire squads, a couple of tactical squads (one of them in a drop pod and held in reserve), a few bikes, 3 Predators, a Devastator squad, 2 Dreadnoughts, a Terminator Captain, and a Terminator squad. As his list was weird, he didn't get any Command Points (maybe just 3). It didn't look Battleforged but we decided to give him a chance. As for me, I brought my Shadowsword, my 3 Leman Russ tanks (one tank Commander, a 2nd Leman Russ Executioner, a Leman Russ Annihilator), my Valkyrie, 2 company commanders, 2 command squads with 4 plasma guns each a lascannon heavy weapons squad, a mortar heavy weapons squad, 2 Primaris Psykers, a Tech-priest Enginseer, 2 Tempestors Prime, and 2 Tempestus command squads with 4 plasma guns each. We rolled off, the Ork guy won the roll and chose to go first, and I rolled a 6 and stole the Initiative. Awesome! 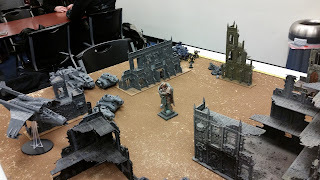 I proceeded to destroy his Stompa with my lascannon squad, Leman Russ Annihilator and Shadowsword, and then used my plasma guys to damage a deff dread and destroy another, and also killed a bunch of Nobz. My Leman Russ Executioners and mortar squads killed a bunch of Boyz in the 20-Boyz squad. My teammate didn't bring his forces in reserve into the table, so my 2 Primaris Psykers and plasma command squads got wiped out in shooting and melee by his Deff Dread, Scorchaboz and Killa Klans because they had no Space Marine support. It's fine. They are called Kamikaze Troopers for a reason. He also put a couple of wounds on my Shadowsword with the Big Meks. And moved his Boyz, Nobz and everyone up. Oh, and he killed my mortar squad. How sad. In the end, only one plasma gunner from the company squad and my Company Commander who dropped with him out of the Valkyrie survived. Finally my teammate brought his forces in reserve to the table, dropping his drop pod and deep striking all his marines and Damned Legionnaires right in front of the Orks, probably to stem the Green Tide (how very narrative-orientated). 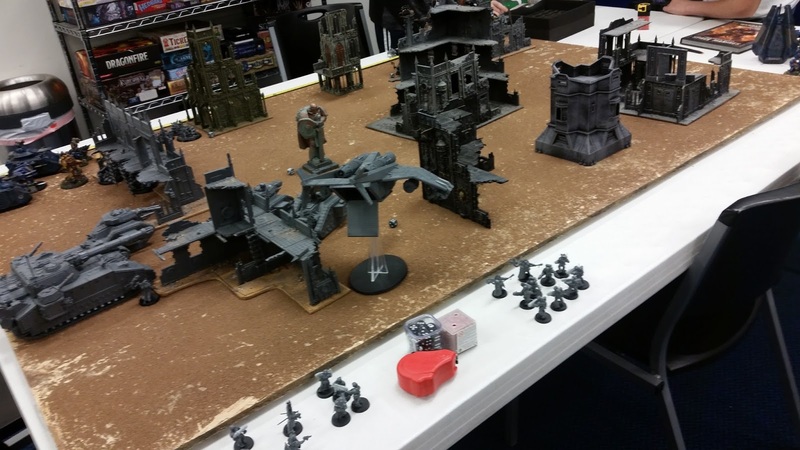 We wiped out an entire squad of Boyz (the 20 dudes I was clearing), I killed the Deff Dread with my Leman Russ tanks and wiped out the Scorchaboyz with my Valkyrie, but my Tempestors Prime got wiped out in combat by the Killa Klans. I also managed to get rid of a few Lootas with my Shadowsword's volcano cannon. The Orks came and slammed into the Marines, with Ghazghul and his Mega-Nobz wiping out both the tactical squad and the drop pod they came out from. They killed 4 Terminators, leaving just one guy, and half of the first Legionnaire squad. Then went into combat and killed all but one poor guy. This was when Guilliman intervened and he killed a bunch of Boyz. Wow. That guy is insane. The final turn saw me destroying the Mega Dread with my lascannon team and Leman Russ Annihilator, and I killed 3 Killa Klans with my Leman Russ Executioners and Valkyrie. On the other hand, my Shadowsword fired and their kustom force fields protected the Killa Klans from the volcano cannon. Holy Terra...oh well. Funnily enough, my Shadowsword had better luck with the Grots, killing at least 7 of them with his three twin heavy bolters. I think I disintegrated a few Nobz with my Leman Russ Annihilator's plasma cannons too, so yay. On the other side, my teammate wrecked more Orks in combat, wiping out the 2nd Boyz squad. I don't think there were too many Orks left on the table, just one Boyz squad left, Ghazghul himself and his Mega Nobz, Tankbustas and Lootas, the Painboy, the Big Meks...and the 3 Killa Klans. Ghazghul ran and charged Guilliman, challenging him to combat. I think he put 5 wounds on Guilliman, who promptly wiped the floor with Ghazghul, dealing a total of 15 wounds in return. The Waaagh! 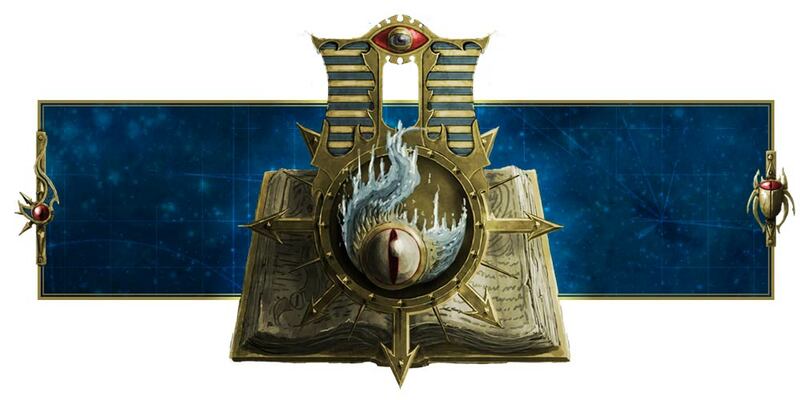 was stopped dead in its tracks and the Imperium scored an invaluable victory under Lord Commander Guilliman. Not surprising. Still, it was a lot of fun, and the Space Marines were looking very...whittled. I think the poor Ultramarines player had only half his Legionnaires left, lost all his tactical squads and all but 1 Terminator, but he still had his Dreadnoughts, 3 Predators and Devastator squad. I also had all my tanks and my lascannon squad, plus the Valkyrie and the lone surviving plasma gunner and his company commander. 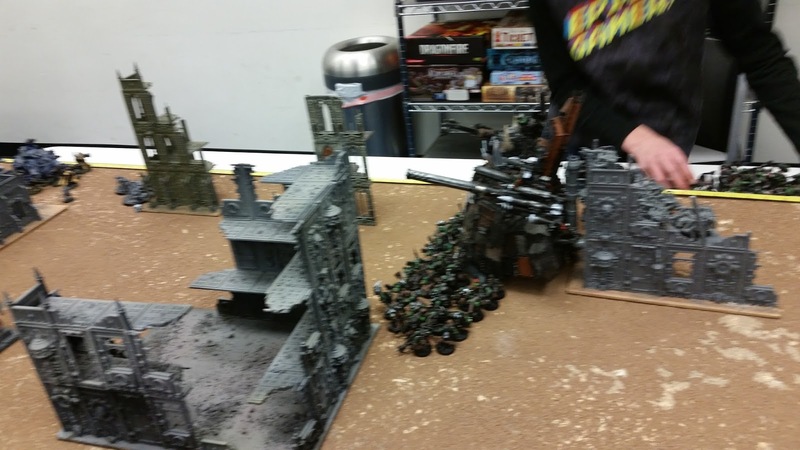 If the game had continued on, the Orks guy would have done more damage, but we would have probably tabled him eventually with all those tanks. Phew. Still it was an extremely exciting and fun game, and even the Orks player enjoyed it tremendously, running his green tide and overwhelming so many Marines, plus making all those invulnerable saves for his Killa Klans against the Shadowsword's volcano cannon! Awesome!